This cake…oh this cake. Banana Chocolate Chip Cake isn’t adorned in frosting, it doesn’t have a glaze and it isn’t sprinkled with powdered sugar. You’ll forget all about fancying it up after you taste it. I ate a slice while it was warm, then I snuck another slice because the first slice was so good! Moist – that’s the first thing you notice about this delicious cake. And why wouldn’t it be, it has a cup of browned butter in the batter. Uh huh, a rich delicious browned butter flavor in every inch of the cake. There’s a slight crisp on the top…not much, just slight. 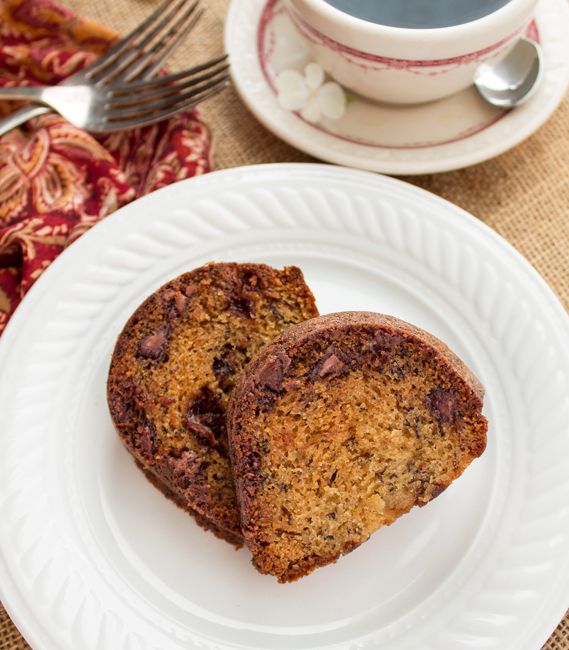 Then your taste buds hit the moist, soft, cake filled with banana flavor, chocolate chips and browned butter. Exquisite, that’s the only way to describe it. 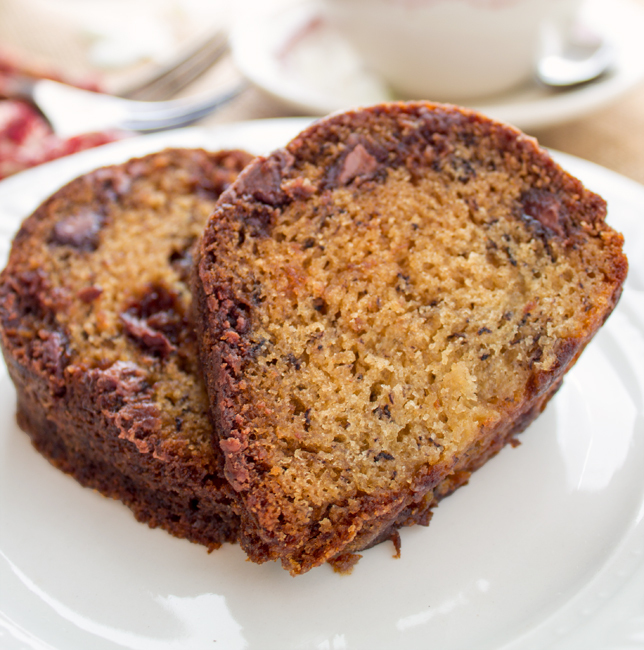 This cake…oh this cake, it’s what I’ll be thinking about as I watch those bananas get ripe on the counter. ENJOY! Preheat the oven to 350°F. Butter and flour a tube or bundt pan. Melt the butter in a medium saucepan over medium-low heat. Once the butter is melted, continue to cook and stir it until it turns an amber color. Be Careful not to over cook or the butter will burn. Remove it from the heat immediately and pour the browned butter through a sieve into a medium bowl and discard the bits in the sieve. Cool the butter to warm. Using a whisk, stir the sugar and eggs into the butter. Whisk until the mixture is smooth. Whisk in the mashed bananas, vanilla, and salt. Sift the flour and baking soda directly onto the batter. Pour the chocolate chips over the flour. Using a spatula, stir just until the batter is incorporated. Don’t overmix. Spoon the batter into the prepared pan, spreading it evenly to the edges of the pan. Bake until a toothpick inserted in the center comes out clean about 42 to 45 min. Set the pan on a rack to cool for 15 minutes. Flip the cake out onto a serving platter. Let cool until just warm and then serve immediately or wrap well in plastic and store at room temperature for up to five days. Just love your site. I think we both love chocolate chips!! Oh yes Judith, there’s always chocolate chips in this house! Amount of butter is missing from ingredients list. I know 1 cup is mentioned in the beginning but does seem like a lot. Thank you for letting me know Carol, I don’t know how that happened but it’s in the recipe card now! Hi Bunny, What size bundt or tube pan did you use? Also, I noticed that there is only 1 2/3 cup of flour in this recipe., which doesn’t seem like much, so I’m guessing that it doesn’t produce a very high cake. Is that correct?